H.Arronottianus - a.k.a. Wilder's White, Tanatalus White, Kokio or Ke'oke'o & Ruth Wilcox (USA) . 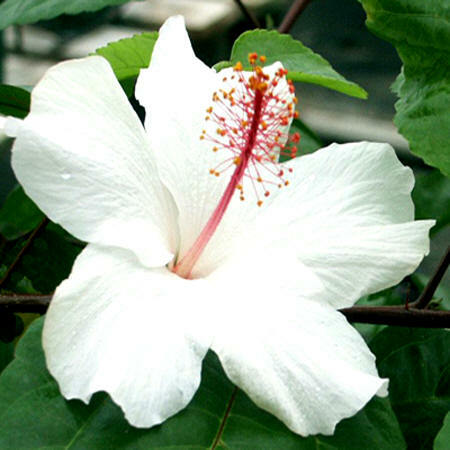 4 to 6 inch delicate pure white petals with a longer red pistil. Very florific. 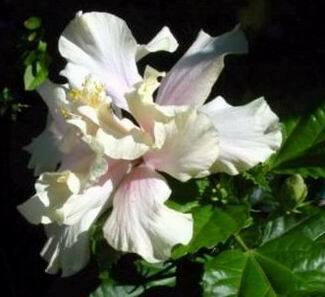 According to the AHS HIBISCUS HANDBOOK, page 35, ......."the flowers have an exquisite FRAGRANCE...". One of the first Hawaiian varieties exported to the hothouses of Europe. 7 to 9 inches. Large double white with pink blush. Base petals are so reflexed that they look like... Elephant ears.... The flower is as high as it is wide and is best white double around...make a great fence or hedge in Zones 9 and 10.